Hey everyone! I’ve been getting a bunch of messages from y’all asking me to spill deets on my designer bag collection so I figured I’d tackle that for my latest. I’ll be featuring 8 of my favorites today on Sensible Stylista. I have 12 total, but I decided not to list the last 4 because I didn’t have solid pictures of them. If you want to see, just shoot me an email (info@sensiblestylista)! If enough people ask, I’ll make sure to do a second segment. Anywho, I call myself the Sensible Stylista because I’m all about shopping smart. I’m extremely choosey when it comes to splurging. I pinch pennies 95% of the time but spend moolah on investment pieces + classics I know I’ll wear forever. High-end designer bags don’t usually go on sale, but I managed to snag most of mine during blowout sales. So without further ado, let’s get to it. 1. Givenchy Antigona: I snatched this baby up a few years ago on the TJ Maxx Runway site. It was on sale for much less so I decided to go for it because I only had neutral investment bags at the time. 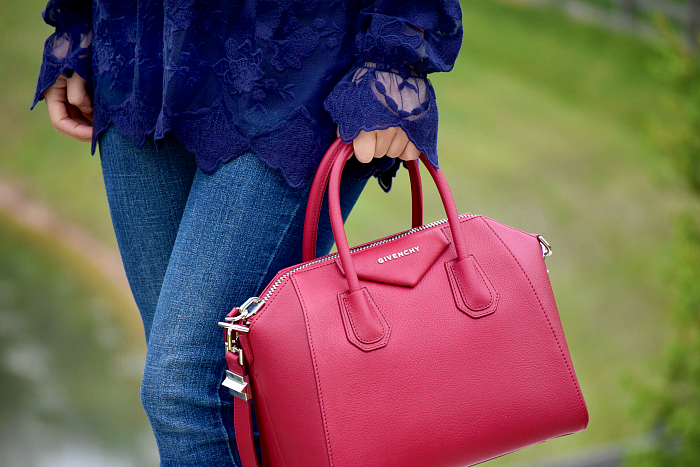 I instantly fell in love with the color and knew it would become a warm weather staple. It’s an easy way to incorporate color when I’m in a rush, and it always ups my outfit’s ante. TIP: TJ Maxx Runway is a GREAT place to get your designer fix (clothing, shoes, accessories, basically whatever your heart desires) for a fraction of the price. They carry a ton of bags, and they update their selection often! Common brands include Valentino, Stella McCartney, and Chloe. 2. YSL Monogram Crossbody (faux-snakeskin print): I purchased this on Bluefly years ago while it was on sale, and it was SUCH a good call. 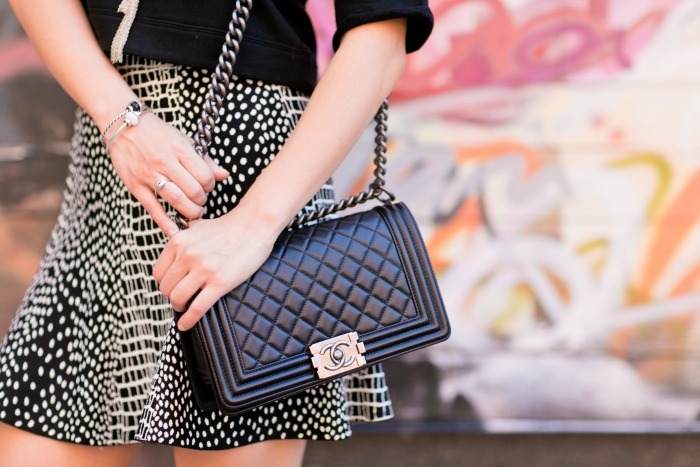 It’s definitely one of my favorite bags – you guys know how much I love animal print. But in all seriousness, it goes with any and everything. I don’t usually like super label-y items, but I love the YSL tassel detailing on this baby. If you’re looking for a trendy crossbody, pick this up STAT! FYI, it’s super small so you won’t be able to fit much in. My wallet’s too big for it so I always have to take my credit card, license + a little cash out and carry it separately. TIP: Bluefly sells discounted YSL tassel crossbody bags from time to time so keep your eyes peeled. If you don’t see any on there, check Nordstrom, Saks or Neiman, BUT make sure you wait for promos. They’ll often give you hella cash back (in the form of a gift card) if you shop their designer garb during the aforementioned times. 3. Chanel Boy: This was my FIRST huge designer buy. Chanel NEVER goes on sale so I had to pay full price aka a ridiculous amount for this piece. It was worth it though! The value just keeps going up so I’m glad I bought it when I did. I actually like this a lot better than the classic quilted jumbo! What do you guys prefer? 4. Ferragamo Crossbody: I copped this crossbody during after-Christmas blowout sales! I don’t carry it as much as I should, but I’m going to change that starting now. The design’s really interesting, and I like that it features different textures – I may or may not have a thing for suede. Who here’s a fan of Ferragamo? TIP: Their after-Christmas deals are BOMB so make sure you get your browse on! Their sale-bag selection is quite large, and they usually give customers a pretty solid discount. 5. Chloe Drew (similar): This purse is the most recent addition to my collection! I bought it during a NY trip a few months back. My mom and I hit up Woodbury Commons and decided to stop by the Chloe Outlet. Thank god we did because they have an amazing selection. After debating for a good hour or so (between a black Faye w/ animal print, an embellished mini-drew, and this), I decided to purchase this design. Warning: Don’t EVER carry light bags with jeans. I made that mistake once and got dye on my mom’s white Chanel! I’m surprised I’m still alive, ha. Seriously though, don’t make the same error I did. 6. YSL Monogram Crossbody (classic black & gold): Another classic! I got this at Nordstrom years ago. I was eyeing this design for quite some time and decided to take the plunge when they offered peeps $500 (or was it $750) back for spending “x” amount of money. I own 2 of these crossbody designs because they’re so versatile – I love that they work well for both casual and formal settings. What do you guys think of the size? Is it too small? Would you prefer the larger bags to this one? 7. Burberry Bowler Bag (beige): I picked this bag up while it was on sale at the Burberry outlet in Orlando a few years back. I vacation there for Christmas every year – I always make sure to check out their sales because their post-holiday deals are BOMB. I’ve purchased a bunch of outerwear there as well. Don’t ever pay full price for Burberry – their outlets sell classics so there’s really no need to spend the extra $$$, unless you’re looking for a specific design straight off the runway. 8. Prada Saffiano Lux Satchel (black): My parents got me this as a (very generous) gift for my birthday/master’s graduation. They NEVER spoiled me growing up (x-mas gifts were like pens and stuffed animals, lol) so they wanted to do something (extra) nice for me. My mom has impeccable taste so she picked this satchel out for me – she knew it’d be a chic option for both everyday wear + work so she split the cost with my pops. It’s a classic that I’ll carry forever, and it has special meaning because it was a gift from them. Yes, it was extravagant, but don’t worry guys! I totally got them back. When I got my first big payout, I got my dad a HUGE smart TV and purchased a Gucci Dionysus for my mama. Alright guys, that’s it for today. 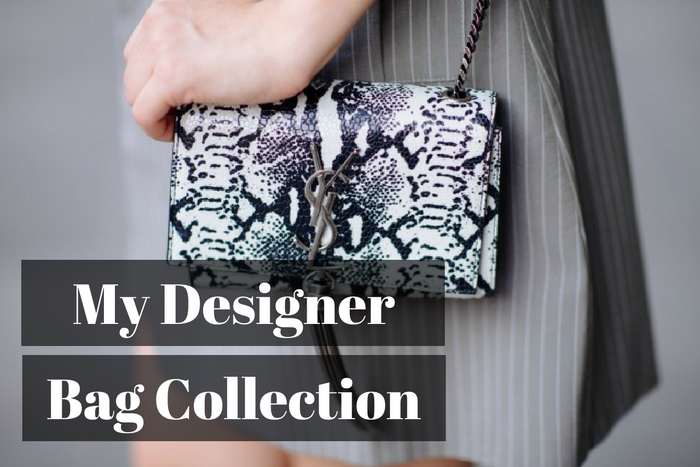 I hope you enjoyed reading about my designer bag collection! Which piece do you guys like the best? Is there a specific design you’ve been lusting for? What’s your dream bag? Definitely let me know by commenting below! To read more about accessories, click here.